Discover benefits of drinking water! Drinking water plays a big role in our everyday health. Water carries nutrients to every cell in our body! Water covers over 70.9% of the earth’s surface. It’s vital for all forms of life. How could I talk about skin care, without mentioning the benefits of water? I couldn’t. The human body has amounts of water from babies to adults, depending on age and health condition. The amount of water in the human body decreases from birth to older age. The most decrease occurs within the first ten years of life. The percentages mentioned above are only ranges. There is no, statistical, number exactly the same for all people. The condition of the body can affect its water content. For example, obesity can decrease body water amounts to as low as 45%. Drinking too much water can burden your circulatory system, causing stress upon your heart and/or kidneys. It can cause inter-cranial pressure. It can cause, Hyponatremia, a condition having too little sodium in the blood. It can cause a mild headache to impaired breathing and even death. Not drinking enough water leads to dehydration affecting vital organs of the body, such as the kidneys and the lungs. Dehydration can, also, affect the condition of skin. Skin is the largest organ of the body. It’s comprised of cells containing water. If your skin does not receive the proper water amount, it becomes tight, dry, flaky, less resilient, prone to wrinkling or develop acne. Water replenishes skin tissue, moisturizes, increases skin elasticity, flushes out toxins, improves blood circulation, increases energy and helps provide a natural, youthful, radiant, complexion. Water provides acne relief. Warm water reduces the size of pores, helping to get rid of blackheads. Drinking water can flush out toxins that build up in the body. Acne may seem to be worsening when drinking more water because toxins are being flushed out of the skin. Don’t worry, this enhanced acne condition is only temporary. You are fighting acne and improving your, overall, skin condition. Acne breakouts will be less likely to occur since toxins have been purged from the skin. Add a slice of lemon to your drinking water! Lemon-water is a natural, stimulating, acne-fighting, beverage! Drinking water AND maintaining a regiment can improve the appearance of skin, overall. The Mayo Clinic suggest the “8 x 8” average rule of drinking eight. 8 oz. glasses of water, everyday. Drink the proper amount of water AND keep it in skin cells! Drink water to moisturize skin. Reduce dry flaky skin and tightness. Drinking water allows skin to be more resilient. For other, easy, face care tips see homemade skin care. Drink water everyday for healthier skin. Follow your sense of thirst and grab a glass of water! The benefits of drinking water are numerous! WHAT is BPS? 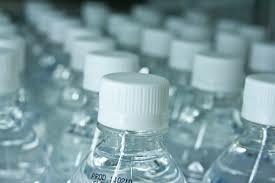 Awareness of "BPA-Free"
On the shelves of of stores across the world, water is found in plastic bottles. Have you read the label, closely? Is the term "BPA-Free" mentioned? You may think you're avoiding toxic chemicals. Think again. BPS is now being used to replace BPA in hard plastics, recycled and thermal paper products. It's less likely to leech into foods/drinks from plastics than BPA but according to the Center of Disease Control, (CDC), it is up to 19 times more absorbable by the skin than BPA! Realistically, completely eliminating exposure to BPA or BPS would probably be impossible in society today. You do have choice in how to reduce your toxic exposure! - Avoid as many plastics as possible. - Choose glass jarred goods over canned goods. - Keep hands away from your mouth. Try washing hands frequently. - Read consumer product ingredient labels. Avoid any known toxins. - Choose glass, ceramic or stainless steel over plastic, especially those products that contact food or drinks. - Get rid of plastic children toys, sipping cups, teething rings, etc…. Choose soft fabric varieties for children, instead. Buy wooden toys. Quality wooden toys last longer than plastic toys anyway. - Choose organic fresh foods, instead of canned. - Limit your contact with thermal paper products. For instance, have cash register receipts placed in bags. Remove receipts from bags with gloves for discarding or filing. Don’t accept gas station receipts. If you work around thermal paper on a daily basis, consider wearing light weight gloves.